– Please be advised that in order to receive the above listed benefits, you must be logged into your Corporate account and the Corporate (Ali’i) fare must be booked. Corporate Benefits and Segment credits will not be awarded to any bookings made outside of your Corporate portal. – Please note: Account status will be reviewed each quarter of the calendar year. All NEW accounts must Join Deposit on Account Program to get started as of Nov 1, 2018. – Remember, to remain qualified the account must travel a minimum of 5 Round Trip Flights (10 segments) per month to automatically qualify for the Mokulele ALI`I + Corporate Travel Program. Failure to meet this requirement will automatically result in movement to the Ali`i Small Business Program which requires 2 Round Trips per month or (4 segments) or possibly require reactivation and join deposit on account prepaid program. 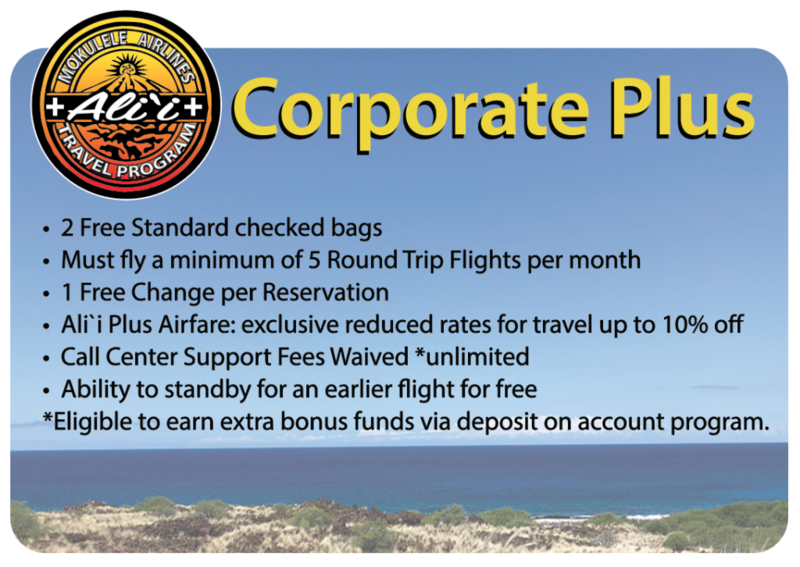 – Any account that is new to Mokulele Corporate travel will be required to join deposit on account program in addition to receiving the benefits of this program “Ali`i Plus Corporate Travel”. – You MUST book the Ali’i2 fare in order to receive the above mentioned benefits. The Ali’i2 fare can be found in the far right column of the flight selection screen once inside portal. If an Ali’i fare is not booked, normal bag & change fees will apply. Bag fee exemption will not be honored. – Sporting Equipment (ie: golf bags, surfboards, gun cases, bicycles, etc.) are EXEMPT from the baggage waiver. The standard baggage fee will apply. – Maximum size and weight for FREE luggage is not to exceed 30”W x 15”H x 45”L and 50 lbs. Any overweight or oversize bags will incur the appropriate fees. – Children under the age of 18 must be accompanied by an adult when traveling on a corporate fare. – It is the responsibility of the account holder to communicate all policies, procedures and subsequent fees to account users and travelers. – Mokulele is not – responsible for any users who book under your corporate account and are not aware of the current policies and/or fees. – For privacy & security purposes, Mokulele will contact approved account administrators only. Any account changes, including password resets, notification emails, etc. will be sent to the approved Administrator(s) we have on file ONLY. – If you require updates to your company’s contact person(s) or contact information, please complete this COMPANY UPDATE FORM and return to us so that we may make the appropriate changes. If you feel your company is a good fit and travels more than 10 one-way flights per month or 5 round trip flights per month please complete the application for Ali`i Plus and submit to us! Please fill out the form below and we will activate as soon as we are able. In addition to the benefits of this program you are also eligible to participate in our `imi loa program. Is your company based in Hawaii? *If joining deposit on account the opening deposit starts at $1000. Please contact your sales rep if you wish to open with another amount.